The Pixelmator First Aid Scripts are a set of AppleScript scripts that can change certain settings in Pixelmator that normally would have to be changed by using terminal commands or deleting files deep inside the OS X system libraries. NOTE: The scripts in this package are made for use with Pixelmator 2.0.5 and higher. Use these scripts with older Pixelmator versions at your own risk. Download and unpack the Zip-file. Installing the scripts is easy. Just double-click on the the PM First Aid Scripts Installer. The PM Fist Aid scripts installer will automatically activate the Apple Script menu-icon in the menu bar. 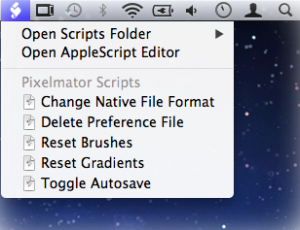 The Scripts will only be accessible from this menu when Pixelmator is running. Deletes the Pixelmator preference file. This brings Pixelmator back to its factory settings, but doesn’t affect the brushes and gradients. Removes all brushes changes, custom and 3rd party brushes packs and custom brushes. After Pixelmator relaunches you will be presented with the default Pixelmator brushes and brushes sets. Deletes all changes made to gradients and removes custom gradients. After Pixelmator relaunches you will be presented with the default Pixelmator gradients. Lets you toggle Lion’s autosave on and off. Pixelmator opens all images as a pxm-document by default. With this script you can turn this behaviour on and off. Turning it off will make Pixelmator respect the file format of the file you want to open and lets you save/autosave back to the same file format in stead of being asked to save to the pxm-format. This fetches all the information the Pixelmator developers need in order to help you with the issue you want to report. Information like your mac specs and type of graphic card will be collected and pasted into a new mail-message. In addition the mail message shows any additional information you might want to fill in before sending the bug report to the Pixelmator developers.